Jeff Miller raised to 160,000 on the button. 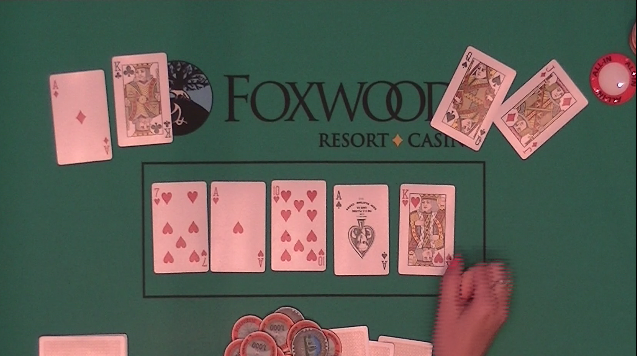 Jason Calnan shoved all in in the big blind, and Miller called. Calnan had Miller covered by quite a lot. Calnan turned over [qc][qd]. When Miller saw Calnan's hand he said, "I am drawing dead here," as he turned over [qs][9d]. The board ran out [jd][6s][4h][5h][8h], and Miller was eliminated in second place. On a board reading [5c][5d][qd][6h][jh] Calvin Ma bet 150,000 and Jason Calnan shoved all in . Ma called and turned over [qc][7h]. But unfortunately for Ma, Calnan had flopped trip fives holding [9h][5s]. Ma was eliminated in 3rd place with a $7,979 payday. The final ten players in Event #6 are currently playing Level 21 (5,000/10,000 blinds with a 1,000 ante). Calvin Ma raised to 110,000 on the button. Jason Calnan reraised to 525,000. "The General" shoved all in for less (480,000). Ma tank folded, and Calnan called. The board ran out [js][5s][3s][qd][9c] eliminating "The General" in 4th Place. Brendan Wiley shoved all in on the button and was called by Jeff Miller in the big blind. "I call, I have aces," Miller said as he tabled [ad][ah]. "Ah man, how do I run jacks into aces here," Wiley asked as he tabled [jc][jd]. The board ran out [3c][4h][8s][2c][7h] sending Wiley home in 5th place. Miller is now sitting with 2,475,000. Melisa Singh shoved all in from under the gun for just shy of 200,000 and Brendan Wiley called in the big blind. The board ran out [9h][6c][5h][7c][kc] giving Wiley the nut flush and sending Singh home in 6th place. Melisa Singh raised to 100,000 (at 25,000/50,000/5,000) on the button and George Kalaitzis having only 50,000 behind, put his remaining chips into the middle without looking at his cards. Singh turned over [qc][10c] and Kalaitzis turned over seven-four off-suit. The board ran out [10s][7c][ac][9c][jc] giving Singh the flush and sending Kalaitzis home in 7th place. Jeff Miller was all in and called by Melisa Singh. The flop came [as][9d][7c] giving Miller the lead with his pair of aces. The [9h] turn and [3h] river did not bring Singh the queen she needed, and Miller doubled up to just over 1,000,000 in chips. Jeff Miller raised to 85,000 in the hijack. Calvin Ma called in the cutoff, and Brendan Wiley shoved all in from the big blind for 234,000. Miller folded and after Ma asked himself, "Why am I always the one left with the tough decision?" he opted to call. The board ran out [3s][kc][8d][9c][9d] to give Wiley a full double up to just over 500,000. Calvin Ma raised to 60,000 on the button and John O'Connor shoved all in for 259,000 in the small blind. Ma thought out loud for a bit, "This would be sick. But you are the tightest player at the table." After a few more moments Ma threw in a chip and called. The flop came ace high, and O'Connor failed to improve on the turn or river so he was sent home in 8th place with a payday of $2,458. Brendan Doyle bested a field of 35 today to take home the top prize of $2,878 as well as the coveted trophy. Ronnie Brown shoved all in for 269,000 from the cutoff and Jason Calnan called in the small blind. The board ran out [kc][7d][2d][4s][qh] eliminating Browne in 9th place. George Kalaitzis shoved all in from under the gun for 182,000. A player in middle position immediately called. Ronnie Browne reshoved over the top from the small blind, and the player in middle position went into the tank. He thought for over 3 minutes, eventually swishing his chip stack around, closing his eyes, and pointing to a chip. "If this is an orange chip, I fold. If it's black, I call." He ultimately ended up touching an orange chip and announced that he folded. The flop and turn came [10d][9h][8c][8s]. Before the river card was dealt, Kalaitzis said, "two." The river came the [2c] awarding Kalaitzis the full double up. He now has 542,000 in chips. The player that folded preflop told the table that he had folded Ace-King. Melisa Singh raised to 50,000 from under the gun. A player in middle position called, and Eric Flores shoved all in for 500,000. Singh called the all in and the player in middle position folded pocket tens. The board ran out [qh][jc][2d][js][4s] sending Flores to the rail with a $1,380 payday, and chipping Singh up to 1,200,000 in chips. Of the remaining 11 players Singh is now second in chips, just behind Jason Calnan who has 1,400,000. A player under the gun shoved for 23,100 (at 1000/2000 blinds w/ 300 ante). The player in the hijack called, as did Tony James on the button. Both the hijack and James checked the [5c][4h][3h] flop and [jh] turn. When the [9h] river hit, the player that was all in accidentally exposed his cards before the other player's had acted. He showed [jc][jd] for a turned set. After a few moments the hijack and James both decided to check and James quickly said, "I check, I have a flush," and turned over [ad][qh]. "Unbelievable," the all-in player said as he packed up his belongings and headed to the rail. The hijack mucked his cards without showing. Tony James is now sitting with 135,000 in chips. Jason Calnan raised to 45,000 on the button, and a player in the big blind shoved all in for approximately 275,000. Calnan quickly called. The board ran out [kh][qd][5s][8d][10s]. As the chips were being passed to Calnan the player that was just eliminated asked Calnan, "How many $&*#@ times can you get aces?" Calnan is now sitting with 1,200,000 in chips. Thomas Little shoved all in and was called by "The General." The flop came [ah][10h][7h] giving Little the straight draw, but putting "The General" into the lead with his pair of aces. The [as] turn give "The General" trips. The [kh] river gave Little the straight, but also gave "The General" a full house to eliminate Little in 16th place with a payday of $1,035. Players just redrew for their new seats as we are now down to the final 18 players in Event #5. The current blind level is 23 (8,000/16,000 blinds with a 2,000 ante). The current chip leader is Jeff Miller with 1,033,000 in chips. Average is currently 380,000. There were 132 entries in today's $300 NLH Bounty event, generating a prize pool total of $26,690. At the time of this post, there are 56 players remaining and they are currently playing Level 11 (500/1,000 blinds with a 100 ante). There were 35 entries in today's $300 PLO High Only event, generating a prize pool total of $8,827. At the time of this post, there are 18 players remaining and they are currently playing Level 9 (300/600 blinds). On a board reading [kc][7d][3d] a player in the small blind bet 4,000 and Peter Tripp called in the cutoff. When the [ad] came on the turn, the small blind led for 6,000, Tripp raised to 16,000, and the small blind called. The small blind asked out loud for a three on the river and without waiting, the [3c] came on the river. He then bet out 11,000. After a moment's pause, Tripp called. Tripp turned over [jd][9d] for the flush. The player in the blind checked his cards twice, and then mucked his cards face down. A player in early position shoved all in for 30,000. Jeremy Meacham re-shoved over the top for 49,000. Jeff Miller called in the big blind. The flop came [ac][7h][2d] giving Meacham the lead with his set of sevens. The [2c] on the turn gave Miller a flush draw, but Meacham a full house. A player in the big blind shoved all in and Ralph Macri called. The board ran out [qh][4s][3h][4d][5s]. Macri chipped up to just shy of 300,000 and his opponent was sent to the rail. We are now down to 32 players in this event, and the average chip stack is 213,750. After a recent elimination and a second count of remaining players, the Floor has just announced that all players are now in the money. A player under the gun limped in. The player in the hijack raised to 400. The cutoff, both blinds, as well as the player under the gun called so there were five to see the flop. All players checked the [ah][jc][6s] flop. When the [9s] came on the turn, James Kapsidis bet 1,400 from the small blind. The big blind called as did the player under the gun. The hijack and cutoff both folded. All players checked the [3c] river. "Two pair," Kapsidis announced as he turned over [jh][9d][10c][8c]. The player in the big blind showed [ks][10h][9h][8s], and the player under the gun mucked his hand without showing. Kapsidis' two pair would take it down and chip him up to just under 10,000 in chips. We are five players away from the money bubble in Event #5. They are currently playing Level 18 (2,500/5,000 blinds with a 500 ante). The prize pool information for this event can be found by clicking this link. A player under the gun limped in and Gerald Aiello made it 600. A player in middle position reraised to1,900. The player under the gun folded, and Aiello called. Aiello checked the [9h][7s][6s] flop and his opponent bet 2,550. Aiello called. Aiello again check-called the [10d] turn when his opponent bet 5,500. 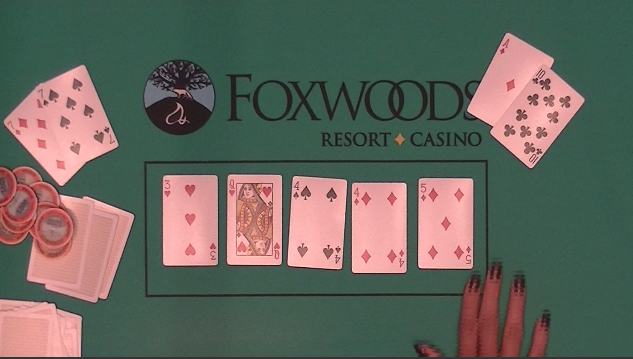 When the river came the [5d] Aiello checked, his opponent shoved all in and Aiello quickly called. Aiello turned over [10c][10s] for a turned set of tens, and his opponent showed [ah][ad]. Aillo chipped up to 45,000 and his opponent was left with around 5,000. A player under the gun shoved all in for 5,600. Steve Dugas called the all in from middle position. The player next to act shoved all in for 16,000. Action folded back to Dugas who thought for a few moments before he eventually called the 16,000. The flop came [10h][js][jd] giving Dugas trip jacks. But the [qd] on the turn gave his opponent Broadway. Fortunately for Dugas, the river was the [ac] to give him the full house. Dugas eliminated both players and collected $100 in bounties. Dugas is now sitting with around 58,000 in chips. Cards are in the air for Day 2 of Event #5 $300 NLH. 60 players remain, with the top 36 players making the money.